Detail - Motorcycle Race, MotoGP, competition | Yamaha Motor Co., Ltd.
February 15, 2018— Yamaha Motor Co., Ltd. (Tokyo: 7272) held the 2018 Yamaha Motorsports Media Conference at the Chang International Circuit in Buriram, Thailand today. 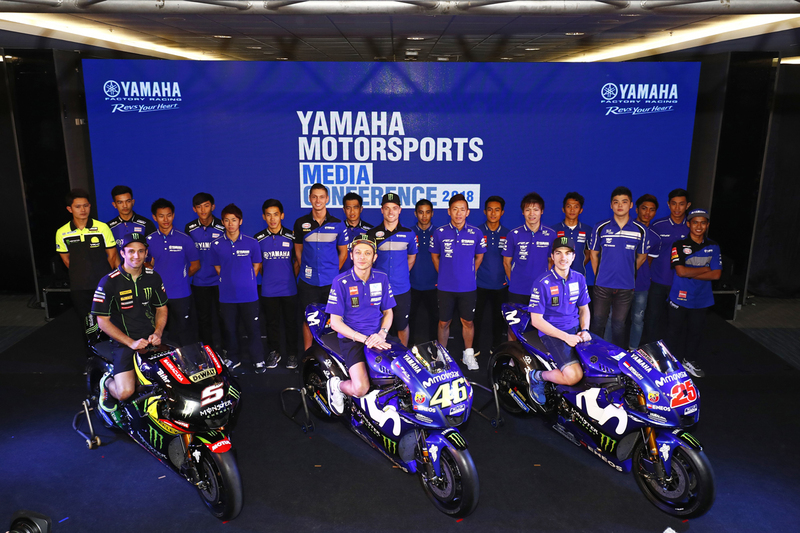 With members of the press and Thai government in attendance, Yamaha announced its motorsports strategy for the season and introduced its riders and teams for major racing series around the world. Following this, Yamaha introduced its riders and teams for racing series around the world, its strategy for MotoGP and the 2018 YZR-M1. MotoGP stars Maverick Viñales and Valentino Rossi took to the stage together with riders contesting the World Superbike Championship, All Japan Road Race Championship, Asia Road Racing Championship and more, each sharing their thoughts and goals for the 2018 season ahead. * Kando is a Japanese word for the simultaneous feeling of deep satisfaction and intense excitement that people experience when they encounter something of exceptional value.